PARIS, France (A.W. )—On Dec. 22, the French Parliament approved a bill criminalizing the denial of the Armenian Genocide and rendering it punishable with a year in jail and a fine of 45,000 euros ($58,000). 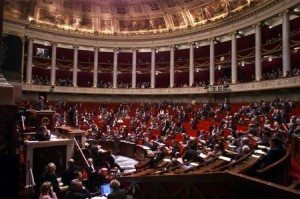 The French Parliament approved a bill criminalizing the denial of the Armenian Genocide. “I will vote thinking of Hrant Dink,” said one Member of Parliament as he concluded his remarks. “We are not punishing any country, but we are fighting against genocide denial in our country,” said another. “We are taking part in the mass destruction of Armenians when we allow its denial… We are voting in the name of Armenians who sought refuge here. How can we look in the eyes of our fellow citizens of Armenian heritage, while we know that there are those among us who deny the suffering of their grandparents?” said yet another Member of Parliament. “Racism is not an opinion, it’s a crime,” said another. The MPs who spoke highlighted the stories of the survivors who arrived in France after the genocide, and talked about the significance of honoring the memory of the victims, the survivors, and their descendants, as well as safeguarding historical truth. Several proposed amendments that aimed at diluting the bill were voted down. More than 2,000 Turks demonstrated against the bill outside the French Parliament building. The French Senate is expected to vote on the bill in March 2012. Official Ankara announced it has recalled its ambassador to France. According to Turkish State Television (TRT), Ambassador Tahsin Burcuoglu will promptly return to Ankara. A special delegation of Turkish officials had arrived in Paris on Dec. 19 to prevent the bill from passing. In contrast, Turkey’s Human Rights Association’s Committee Against Racism and Discrimination had issued a press release and had initiated a signature campaign calling on Turkey to unite against genocide denial, not against the French Parliament. In 2001, France adopted a bill officially recognizing the 1915 events as genocide.